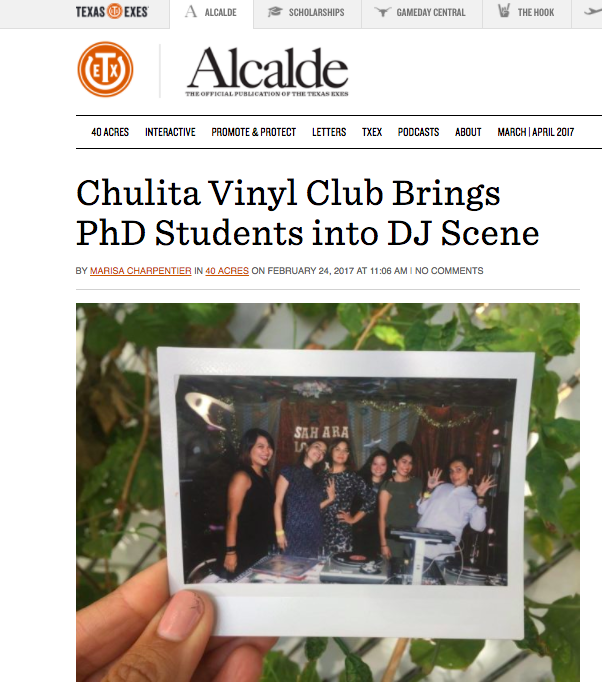 The University of Texas at Austin's alumni publication The Alcalde speaks to Chulita Vinyl club members about their role on and off the UT Austin campus. Take a read! ¡CHULXS! Latinos Who Lunch's BONUS EPISODE is out and that means LA LISTA of CVC'S FAVORITE VINYL ALBUMS OF 2016 is up live! Chulitas from all chapters contributed their favorite newly released or vinyl reissue and it's stellar! Take a peek and if you don't hear a s/o for your favorite record share with us what had you rushing to the record store! Check us out on We are mitú! "The CVC is what happens when you smash together collectivism, activism and expression. Grown from cities experiencing massive urban upheaval, waves of gentrification or cataclysmic change in neighborhoods that are (or were) historically made up of people of color, CVC nowe has branches in Austin, San Antonio, the Rio Grande Valley, Los Angeles and the San Francisco Bay Area." Check us out on Ms. Magazine! "Entrevistamos a Claudia y Maribel, dos integrantes de Chulita Vinyl Club, una red de coleccionistas femeninas de vinilos en los estados de Tejas y California. Platicamos acerca de la continuación del legado familiar de las rancheras a través de los vinilos, sus esfuerzos por fomentar escenas gestionadas por mujeres y del amor y el elitismo endémicos al coleccionismo."